School Bus Crash on Congress Avenue In Boynton Beach | Schuler, Halvorson, Weisser, Zoeller & Overbeck P.A. A school bus crash with children on board occurred on Congress Avenue just south of Hypoluxo Road in Boynton Beach. 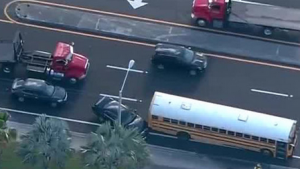 Boynton Beach Police say a car collided with the school bus near Hypoluxo Road and Congress. The bus with students on board was headed to South Tech., according to the police. The wreck caused heavy traffic delays blocking two lanes of traffic near Meadows Park. Chopper 5 flew over the area and spotted a car hit the back of a private bus for South Tech. Boynton Beach Fire Rescue responded to the scene. Boynton Beach police spokeswoman Stephanie Slater said children were on board at the time of the collision, but it is unclear if anyone was hurt. Chopper 5 spotted another bus had arrived to transport the students to school following the wreck. There are traffic delays in Boynton Beach due to the school bus crash in Boynton Beach. Drivers are advised to use alternative routes. Boynton Beach police is on the scene to investigate the crash and clear the wreck. It is unknown if speed or alcohol was a factor in the crash.